Editing is integral to the writing process, but its role is often misunderstood. What if editing could make writing less stressful and more enjoyable? What if it could help you write sharper, more compelling prose? 'The Editor's Eye: A Practical Guide to Transforming Your Book from Good to Great' shows you how editing can help you write your best book. In this no-nonsense guide, book coach and editor Stacy Ennis takes you through the ins and outs of the often bewildering book-editing process. As you begin to understand how writing and editing complement each other, you’ll become more confident as a writer, finish your book faster, and move toward the ultimate goal: publication. * Master the basics: Understand the four core editing stages and when they should take place. * Write with an editor’s eye: Streamline your writing with self-editing tips. * Hire and work with editors. Learn where to look, what you can expect to pay, and how to collaborate. * Revise painlessly. Implement editor and reader feedback with ease. * Learn from the pros. Get advice from 20 publishing experts, fiction and nonfiction authors, and editors. 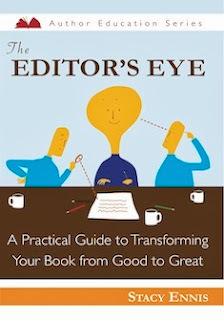 To learn more about 'The Editor's Eye' and to download free resources, such as a sample style guide, sample letter of agreement, manuscript review form, editing checklist, visit www.stacyennis.com. Editing is an important part of the publishing process but it's often misunderstood, undervalued, and/or causes authors to pull their hair out. This book explains everything about editing, from misunderstandings about editing to the different types of editing to talking you through the editing process, and how to hire an editor and work effectively together. Each section of the book includes an interview with an industry expert to put some of the information covered into real world examples. This book is thorough and well written. A good resource for all writers but also worth a read for editors too.